At a young tender age, living in the south of the Netherlands in Tilburg, my dad installed my love for stories. Even if he himself was more of a music kind of person. I vividly remember mostly watching Jim Henson productions with him, like The Storyteller and the film The Dark Crystal. Even though the Skeksis scared me as a child, I was fascinated by the tale. Reading stories however, I pretty much stopped doing for years because in high school here they tend to force students to read a brand of stories that didn´t gel well with me. Because of this I for years considered myself to be more of a visual kind of person, in that I'd rather watch TV shows and films than read novels. Things changed when I decided to start listening to some novels in audio format and from then on I was able to pick up novels and actually read them. I became a very avid reader and mostly enjoy the science fiction genre, with a particular love for space opera. I started out with the more easily accessible novels such as Ender´s Game by Orson Scott Card and Ringworld by Larry Niven, then later on started to take in the very thorough world-building and storytelling of Peter F. Hamilton, Neal Asher and Alastair Reynolds. 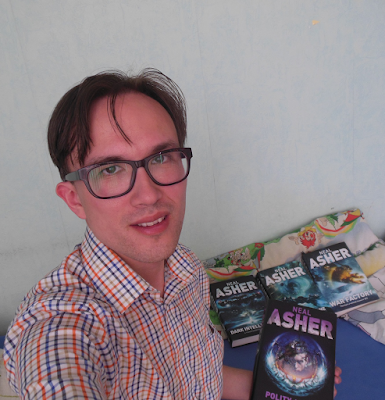 I started reading Neal Asher with Prador Moon and enjoyed it so much that I decided to continue with the Agent Cormac prequel Shadow of the Scorpion. After that I started the original series with Gridlinked and Neal Asher became one of my favourite writers. The main reasons being that I enjoy the relationship that is there in the novels between man and technology, the xenobiology that is part of the world-building and the artificial intelligences that are present within basically all universes that Neal has created. In my daily life I also run into the interaction between man and technology, although it is more on the financial side because of the pragmatism I was taught at home when choosing my profession. I graduated from Fontys University in Eindhoven in 2006 in Business Informatics. I´m currently an application engineer for bookkeeping and logistics software, working for a construction company that is part of VolkerWessels. Although they mostly build locally in the Netherlands, they have some projects in the UK and Canada as well. The work varies from implementing invoice recognition systems called OCR, to asphalt tracking systems and regular financial management reporting tools. 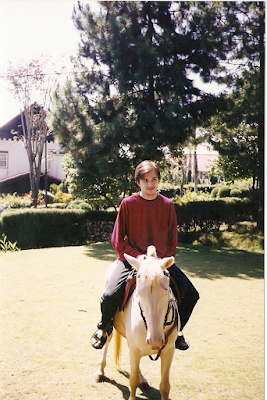 I´ve an Indonesian mother and, because of that, I love traveling a lot as well and have been in my mother´s birth country a couple of times. This picture was taken when I was a bit younger and riding a foal in Malang, a village near the mountain Bromo on Java. Because of the conservative upbringing I´ve had, I´ve also been to odd places such as Jerusalem, the city of the three monotheistic religions. My interest in mostly British writers and Doctor Who has also lead me to visit different places in the UK from London to Cardiff, and from Nottingham to most recently Edinburgh. I was able to get some hard covers signed in person by Peter F. Hamilton, Alastair Reynold, Stephen Baxter and Ken MacLeod so far. Hopefully I get that chance to do so for some of Neal´s novels some time. Which brings me to the specific hobby I have in collecting hard covers, which I´m often on the hunt for. I collect both of classic science fiction writers as well as modern ones. My favourite classic writer is Robert Heinlein, who doesn´t seem to have lost its poignancy to me. And as mentioned before Neal Asher is among my most favorite ones of the modern writers. 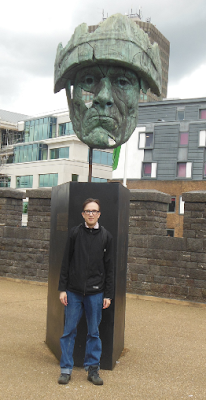 Whether he writes from the viewpoint of a human, crab-like species such as the Pradors, an ambigious entity such as Dragon or androids such as the Golems (especially in Brass Man) he has the power to find the core essence of the beings he´s writing about. So I want to join the other readers into thanking Neal for the great stories he´s been able to put on paper so far, as well as hoping there are many, many years ahead of us in which he´ll add many more books to our shelves!